Different from my regular posts, this one is a review of 1810 Emerson House, a bed and breakfast in Beloit, Wisconsin. For more information click 1810 Emerson House and on Facebook search for 1810 Emerson House bed and breakfast. 1810 Emerson House is owned and operated by Beth and Tony Bonasera of Beloit, Wisconsin. Beth is a quiet, petite, caring lady that truly thinks about the well-being of others. Tony is an extrovert with a huge heart, Sicilian heritage, a cheerful smile, and a love for cooking. Together this married team live out their gift of hospitality whole heartedly. After a stay at their bed and breakfast it is easy to leave feeling like you made new friends. A personal note about Tony and Beth Bonasera is they remind me of a passage from the Bible. Romans 12:6-8 In his grace, God has given us different gifts for doing certain things well. So if God has given you the ability to prophesy, speak out with as much faith as God has given you. 7 If your gift is serving others, serve them well. If you are a teacher, teach well. 8 If your gift is to encourage others, be encouraging. If it is giving, give generously. If God has given you leadership ability, take the responsibility seriously. And if you have a gift for showing kindness to others, do it gladly. This is the dining room and like all the rooms of this house the details and elegance is amazing. Visitors are surrounded by fun and unique décor that add to the warmth and grace of this bed and breakfast. Tony and Beth do an excellent job of treating all visitors like royalty. The breakfast on this stay was a stacker. It was short-sighted of me to not write down the different layers of this breakfast stacker however it was delicious! The stacker was served with a fresh fruit cup that was almost too pretty to eat. Dessert was a bread pudding that would rival any fine restaurant anywhere. As a personal favorite I have had bread pudding many times and Tony’s is phenomenal! Lest I forget the coffee was great too. This was the second time we have stayed at this bed and breakfast and look forward to future visits. If you are planning a trip in or near Beloit consider staying at this bed and breakfast. It is also a great gift idea for someone special, like your Pastor and wife. Follow this link for more information 1810 Emerson House. I was planning to write a review on this wonderful bed and breakfast we stayed at but got sidetracked with an improvement project. As you can see from the photo my office is being repainted. Technically I repainted the office already. However my desk is still under a plastic sheet and I am using the dining table to write this post. This room really needed some upgrades since before we bought the house. However, painting is not my favorite thing to do. In fact it is one of my least favorite things to do. Okay, to be honest I hate painting. It’s messy and time-consuming, hard work. So there it is, the reason I have been struggling with a dark, poorly lit office for almost two years. The next step is to install a really nice ceiling fan. Actually the fan was the catalyst for the office patch and paint work. The moment I saw that fan I wanted it in my office. Being too cheap to buy it for myself, my wife and daughter got me gift cards for half the price of the fan for a Christmas present. When it is all done I will have a very nice office to work in. Just a few more days of improvements left on this project. Few people will ever know or see the improvements to my office but I will. It will be a true pleasure to have a space that is tailored to me. The difficult tasks in life aren’t as bad when you can see future possibilities. Sometimes to be better used by God we have to do some self improvements. Most of the work that goes into preparation to serve God in life will never be seen or appreciated by the outside world. At least you and God will know, that’s all that really matters. Have you noticed how many of us live life from one countdown to the next? Wake up and the countdown begins till it’s time to leave for work or school. At the job or class the countdown continues to the next break or day end. Then the countdown to bedtime and often that means setting an alarm… countdown to next day. It doesn’t end there either. Always looking ahead to the next deadline, weekend, vacation, etc. In some ways our very survival as a species depends on us getting things done in the right time and season. However, most everything we fill our lives with have little to do with survival. It is hard to enjoy life because of the constant pressure of the next event. What if we learned to live right in the moment we are in? Have a book handy in case you are delayed at an appointment such as a Doctor or Dentist. Use commute time to listen to an audio book, pray, meditate on scripture, or just enjoy the travel. At work or school use those few minutes before break to be productive. Creatively use the moments normally wasted and instead do something meaningful. We could all learn to enjoy scheduled downtime more fully if we learn to live in the moment. Vacations wouldn’t end so quickly in our minds. Life would be more fully lived. Do Americans need a “higher education” meaning a college degree? The simple answer is no. There are plenty of well-paying jobs in trades and manufacturing that do not require a college degree. However, there is a shortage of workers with the ability to use critical thinking skills. Those skills are acquired through learning math, reading, music, and other “useless” school subjects. It is not necessary to teach a kid how to balance a checkbook, do basic tax return, or even fill out a job application. All that will be easy enough to learn if they can read, follow instructions, and do basic math. To have a better workforce and sustainable jobs in the future we must invest in the lives of our youth today. Help them understand how the school subjects they find boring have lifelong value. 2018 has been a difficult year. Maybe the hardest year of my life. In 49 years of life I have lost loved ones, been homeless, lost jobs unfairly, and had trusted friends turn on me. Divorced my first wife because of repeated infidelity. Been through a few rough patches in life to say the least. But this year has taken bronze, silver, and gold for all time crappy years! Yet God has blessed me along the way. Such an amazing thing. How wonderful is God’s love for His children! Here’s to a new year. Remember that God never wastes a hurt. We as humans are vastly different than any other animal. It is Past time for us to accept that fact. A part of that is we have an eternal soul. Don’t love people into hell! 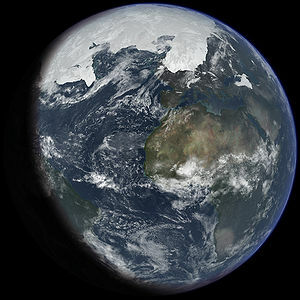 An artist’s impression of ice age Earth at glacial maximum. Based on: Crowley, T. J. (1995). “Ice age terrestrial carbon changes revisited”. Global Biogeochemical Cycles. 9 (3): 377–389. Bibcode:1995GBioC…9..377C. doi:10.1029/95GB01107. An ice age is a long period of reduction in the temperature of the Earth‘s surface and atmosphere, resulting in the presence or expansion of continental and polar ice sheets and alpine glaciers. Within a long-term ice age, individual pulses of cold climate are termed “glacial periods” (or, alternatively, “glacials” or “glaciations”, or colloquially “ice ages”), and intermittent warm periods are called “interglacials“. In the terminology of glaciology, ice age implies the presence of extensive ice sheets in both northern and southern hemispheres. By this definition, we are in an interglacial period—the Holocene—of the current ice age. The current ice age began 2.6 million years ago at the start of the Pleistocene epoch, and the Greenland, Arctic, and Antarctic ice sheets still exist. So I started this post with an excerpt from Wikipedia. Why would I do that? Because most people believe Google and Wikipedia rather than the Bible. According to research found on the internet concerning the Ice Age we are in an “interglacial” period. That means we are at the end of or between ice ages. Further research and observation is the fact that many animal skeletons are being discovered as ice sheets melt. This indicates that these areas were once warm enough for land animals to thrive. The warming periods were not created by man-made pollution. So if science is fact, the earth is millions of years old and has periods of getting cooler and then warmer. All that without any man-made help! According to creationist scientists, if the Bible is factual the ice age probably started as a result of the global flood known as the Noahic flood. However, the world will not end because of global warming. By studying the creation account we can assume a responsibility to reduce pollution, and use the earth for the benefit of humankind, that is if you believe the creation account. Yet the question still remains what can we do as individuals to reduce the amount of waste we generate? More importantly what can Christians do to leave a better world for those yet to be born?